Restoring Our Jewish Roots: Birkat Hachama - Blessing of the Sun - Every 28 years! Birkat Hachama - Blessing of the Sun - Every 28 years! God said, “Let there be lights in the expanse of the sky to separate day from night; they shall serve as signs for the set times—the days and the years; and they shall serve as lights in the expanse of the sky to shine upon the earth.” And it was so. God made the two great lights, the greater light to dominate the day and the lesser light to dominate the night, and the stars. And God set them in the expanse of the sky to shine upon the earth, to dominate the day and the night, and to separate light from darkness. And God saw that this was good. And there was evening and there was morning, a fourth day. Birkat Hachama (ברכת החמה, "Blessing for the Sun") refers to a Jewish Blessing that is recited in appreciation of the Sun once every twenty-eight years, when the vernal equinox as calculated by tradition falls on a Tuesday (the Third Day) at sundown. Jewish tradition says that when the Sun completes this cycle, it has returned to its position when the world was created. According to Jewish tradition, the sun was created at the spring equinox, the first hour of the night before the fourth day of Creation. 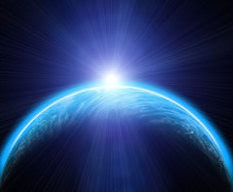 Every 10,227 days – according to the Babylonian Talmud, tractate Berachot 59b – the sun returns to its position at Creation. As codified in the Shulchan Aruch and on the basis of intricate calculations reconciling the Jewish and Gregorian calendars, Birkat HaChammah, a prayer service marking this 28-year cycle, is conducted on a Wednesday in the month of Nissan, when the sun is about 90 degrees above the eastern horizon. The year 5769 is such a year. 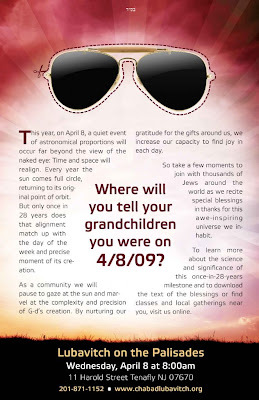 The Blessing of the Sun takes place on April 8, 2009 (erev Pesach). Shehecheyanu is not recited, because this blessing is only a blessing of praise, just as no shehecheyanu is recited when making the annual blessing on fruit trees.